A link to "Configure private wireless Internet for the Business Wireless Gateway" will be sent via email. We hate spam. The information you've entered will not be shared or sold. Your link to 'Configure private wireless Internet for the Business Wireless Gateway' has been sent! This document provides instructions about configuring wireless settings for the Business Wireless Gateway to operate correctly. Note: This article applies to the Cisco Business Wireless gateway devices. Information on the Netgear N300 wireless router can be found here. Setting up the Wireless Business Gateway for wireless communication provides you with the freedom to connect to the Internet from any location within range of the Wireless Access Point (WAP) without having to use wired connections. This section provides procedures for configuring the WAP to meet your needs. These options are available as tabs on the Gateway > Connection > WiFi page. 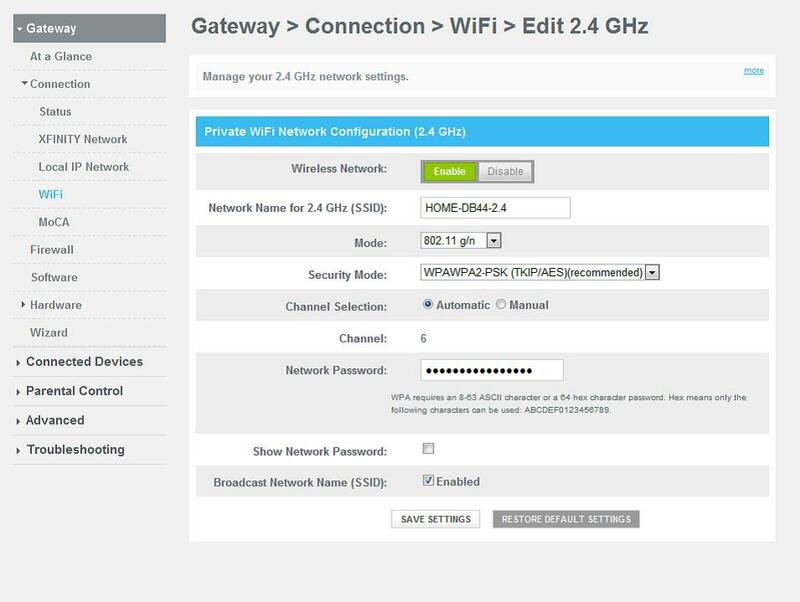 Private/Guest WiFi Network - Use this page to choose the wireless network mode that the Wireless Business Gateway will use to set up other basic features including Security mode and Network Password. 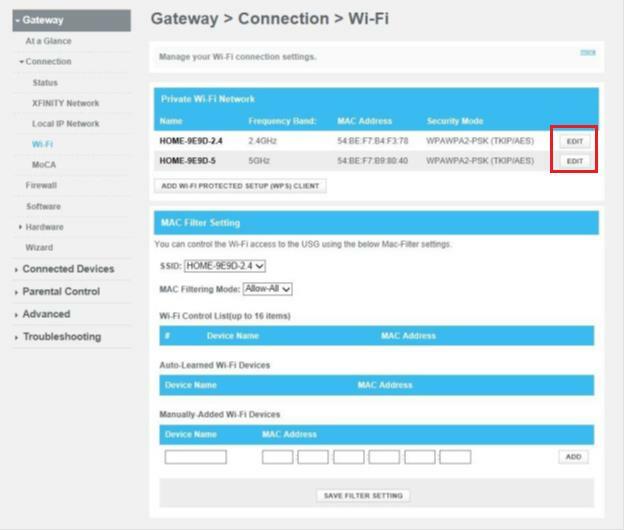 MAC Filter Settings - Use this page to configure MAC address filtering for your wireless network separately for 2.4 GHz and 5 GHz networks. Add WPS Client - Use this page to manually set up and connect WPS clients with the WPS PIN method and Push Button. Open a web browser and enter http://10.1.10.1. in the URL field, then press Enter. Select Connection, then Wi-Fi on the left side of the page. Select EDIT next to either the 2.4 GHz or 5 GHz Frequency Band to access for each. Use this setting to enable or disable the wireless network. The SSID is the name of your wireless network. The SSID is used by wireless technology to identify your network from other wireless networks in the area. The SSID can be up to 32 characters long. The factory-set SSID is CBCI-XXXX-2.4 where XXXX is the last 4 digits of the cable modem MAC address, which is found on the label located on the bottom of the Business Gateway. The factory-set SSID is a unique identity and does not need to be changed unless you choose to do so. Select either 802.11 g/n or 802.11 b/g/n. Important: When TKIP authentication only is selected, B/G/N Mixed network mode is not available. Select Automatic (factory default) to have channel selected for you. Select Manual to select channels from the Channel field. When the Manual option is chosen for Channel Selection, use this field to select a channel from 1 through 11. Note: Only channels 1, 6 and 11 are non-overlapping channels. Depending upon Security Mode selected, the Network Password can have different requirements. The factory-set password value can be found on the label located on the bottom of your Business Gateway. To show or hide the Network Password from the user. Every time the page is opened, this box is unchecked for security reasons. When this box is checked (factory default), the Business Gateway transmits or advertises its presence to other wireless devices. Client devices can automatically detect the access point when this is enabled. If you want to hide your network from wireless clients, leave this box unselected. When your network is hidden, you will need to configure each of your wireless client devices manually. After you make your selections, select Save Settings to apply your changes or Restore Default Settings to set values back to factory default values. The factory-set SSID is CBCI-XXXX-5 where XXXX is the last 4 digits of the cable modem MAC address, which is found on the label located on the bottom of the Business Gateway. 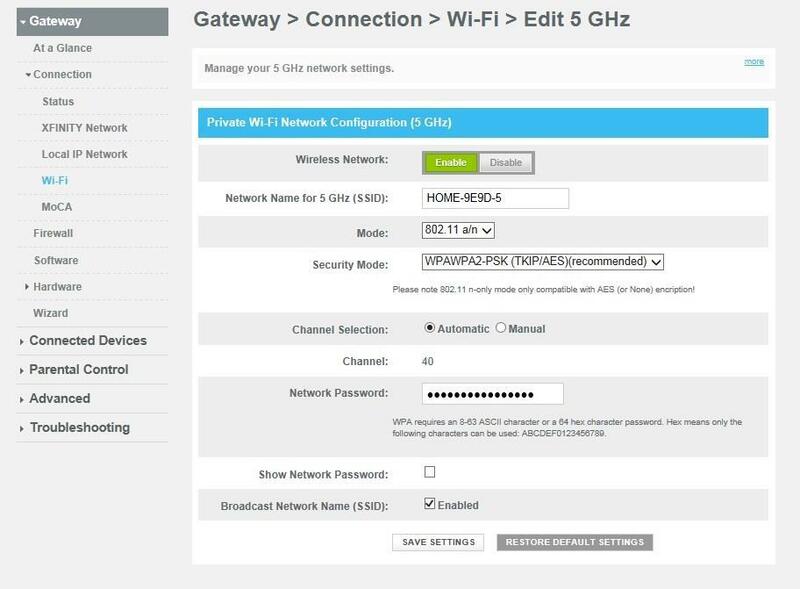 Select either 802.11 a/n or 802.11 n. Important: The following Security mode is recommended: WPAWPA2-PSK (TKIP/AES). When the Manual option is chosen for Channel Selection, use this field to select a channel from 40, 48, 153, and 161. Thank you! We've received your information. The Business Wireless Gateway provides both public and private WiFi for your business. Find common solutions to troubleshoot connectivity issues with the Business Wireless Gateway. Get started with your Business Wireless Gateway by installing and finding your default Wireless Network information.